The shortest path to a story is sometimes the object you hold in your hand. What I’ve found so interesting about going through the memorabilia of my maternal grandmother (she died in Newton, Kansas, in 1980), is that she left stories with almost every item she saved. 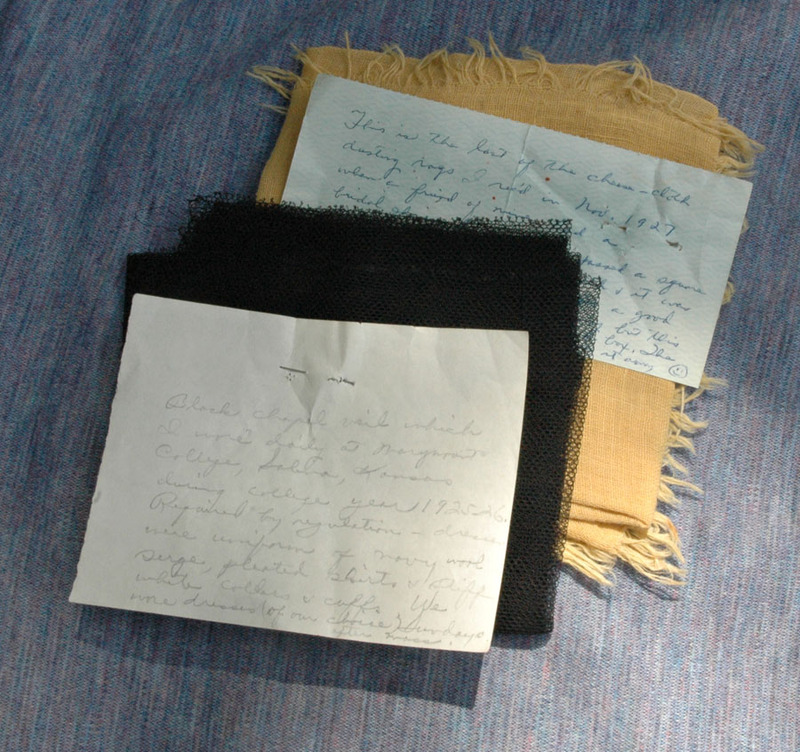 Her methods were low-tech (most often a hand-written note pinned to a piece of fabric), but they left many snapshots of her life and times. Take this little square of black netting, for instance. Alone it is just a worthless scrap of fabric that might as easily go to Goodwill as to the trash. Instead, I learn from my grandmother’s note that she attended Marymount College in Salinas, Kansas, in the 1920s – and that she had to wear this veil to chapel every day, accompanying her uniform of navy wool serge with a stiff white collar and cuffs. But, she notes, they could wear a dress of their choice on Sundays (after church, that is). That’s a lot of information out of so small an artifact, and she wrote many similar notes. Her descriptions – anecdotes, really – have made me realize two things: one, that I should start writing and recording notes for my own (and my children’s) “keepsakes;” and two, that artifacts are a great entrée to discovering new stories – or eliciting them. As you mine these bits and pieces of a life, not only will you help reluctant subjects get started, but you will often get stories that you wouldn’t have thought to ask about. So the next time you want to get a story from Mom, grandpa or Aunt Mildred, try collecting a group of items from their desk, bedside table or box of mementos (or ask them to collect items themselves), and hand them over, one item at a time, with your digital recorder at the ready. When you ask, “Tell me about this…..,” I think you will get more than you expected.